Summary: Speech recognition has the power to dramatically improve efficiencies within your organisation. Within this session we will unveil the many benefits our solution, SpeechReport has to offer and the ROI our customers have noted. This webinar has now taken place. Please fill out the form below if you’d like to receive a copy of the recording. Benefits and ROI noted by our customers. Are you looking to improve document turnarounds? Is speech recognition something you’ve considered in your organisation? Are you interesting in finding out more about speech recognition generally? Well, you’ve come to the right place. 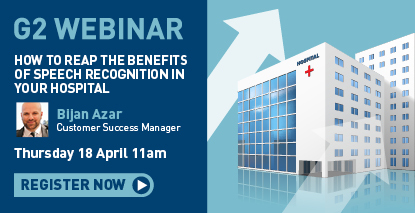 During this 30 minute webinar, we will provide you with an overview of our speech technology and provide insight into how we have seen speech recognition revolutionise healthcare organisations. We’ve seen first-hand the impossible 24 hour turnarounds become a reality, the £3.5m cost savings achieved and the ever increasing workloads managed with the same resource available. Learn more about how to streamline your document production process whilst improving security and data quality.